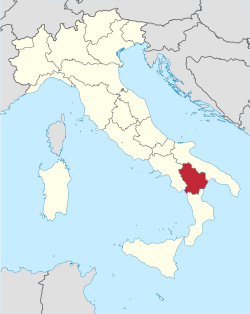 Basilicata is one of Italy’s most under populated regions due to its extremely mountainous terrain, a lack of agriculturally viable land, and desert-like areas in the central and eastern sections. The two short coastlines lie on the Tyrrhenian Sea to the west and the Ionian Sea to east. One jewel of viticulture in the north is defined by the extinct volcano Monte Vulture (4300ft/2005mt), which is covered with vines and chestnut groves at its midrange altitude. Basilicata is home to the Aglianico grape varietals, whose origin is still in dispute. The powerful red grape, with small berry clusters and a thick skin, is thought to have been brought to the Italian peninsula by the Greeks; others believe it is an Italian wild vine that was domesticated by native tribes in the Bronze Age. In any case, the synergy of land and vine come together here in perfect harmony. The altitude, the potassium-rich soil, temperature variations, and exceptional drainage capabilities complement the late-ripening varietals and allow it to reach its full potential. Since most viticulture in this region is family oriented, private winemaking makes up a large portion of the region and is controlled by a handful of noteworthy producers.